These two GoldenDoodles, named Izzie and Sadie were brought in by their owner to surprise her spouse. 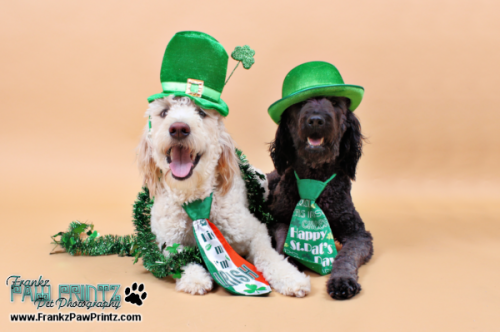 Having met on St Patrick's Day, a Shamrock theme was wanted for the dogs' portraits. 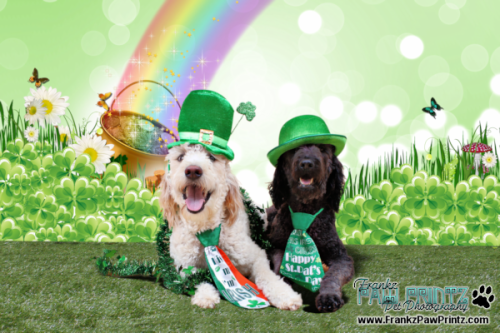 Right now I am at Happy Dog Bakery shooting Easter portraits, so I did not have a Saint Patrick's Day background specifically. 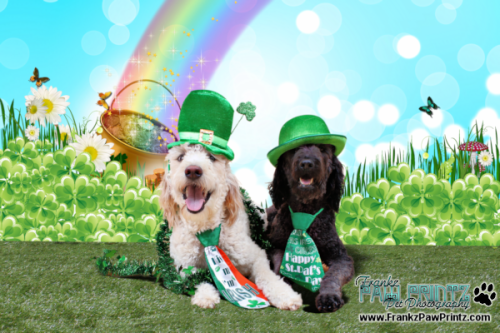 So we decided on using a Buff colored background with St Pat's Day accessories. Cute enough ... but I really wanted to have it more special. After the shoot, I went into my digital darkroom and started playing with creating a new background. I came up with a very cute and fantasy looking backdrop that I will end up printing onto one of my actual backdrops. I just can't decide between the Blue or Green Sky! What do you think? Leave me a comment and let me know. 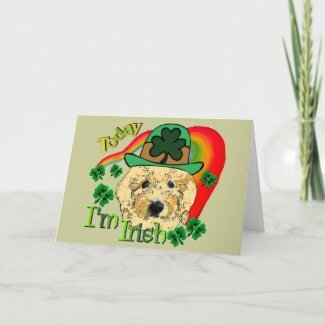 Once again, I'd also like to share another one of the other wonderful artists on Zazzle by showing you their St Patrick's Day GoldenDoodle designs.